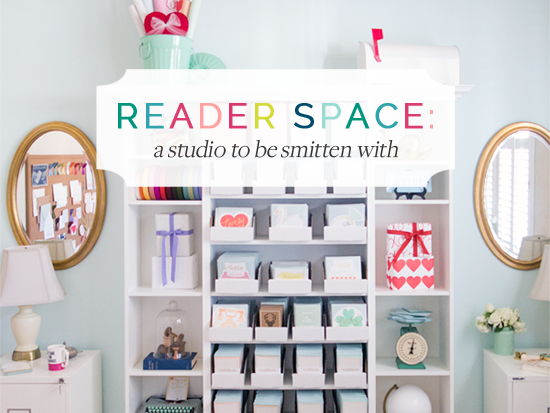 IHeart Organizing: Reader Space: A Studio to be Smitten With! 22 Reader Space: A Studio to be Smitten With! As much as I am in full on kitchen mode around here, I am ready for some new inspiration. And I am not talking kitchen inspiration (I have seen enough of that to make my head explode lately). 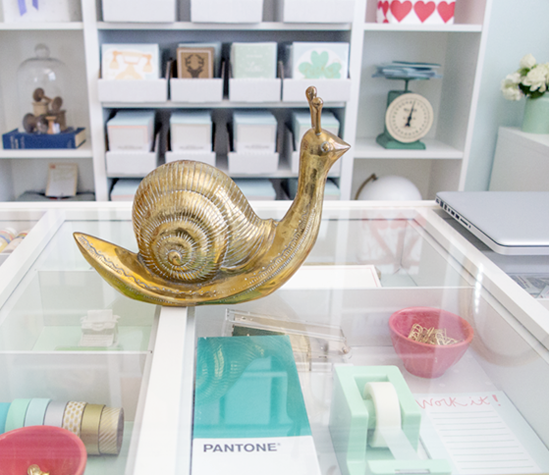 I am talking organizational, colorful, sweet, studio inspiration. As a fellow small business owner, I can totally relate to the importance of working in a space that makes your heart happy. A space that ignites creativity yet functions well for your daily routine. When I first clicked over to Katelyn's studio, my eyes were as big as the moon. Every last moment spoke to me. It is fresh, filled with love, organized and is designed from a beautifully soothing color palette. Smitten is only the tip of the iceberg. The best part? I know not everyone has a small business or studio, but many of us have bedrooms, closets, home offices and even living areas that must function as some sort of working space. This room is inspirational and offers eye candy for any type of room. Katelyn runs her blog, business and shop from this space, and I asked her to stop by and share more about how she made it special and functional for her. Here she is now with more details. "Having a happy work space has always been important to me. When I decided to expand my blog into a Stationery Line & full time business I knew I would need to upgrade my workspace. After a few months of organized chaos I was able to transform my spare room into a bright & cheerful area filled to the brim with bright colors, inspirational imagery & lots of creative supplies for all of my artistic hobbies." 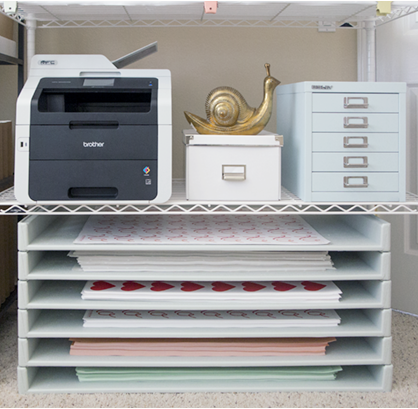 "I am BIG on keeping things organized & intentionally chose items for the studio that would not only look great but would be able to store everything in a clean & colorful way. One of my favorite finds here is my Bisley Light Blue 5-Drawer Cabinet!" "Clean & classic lines were really important to me in this space. 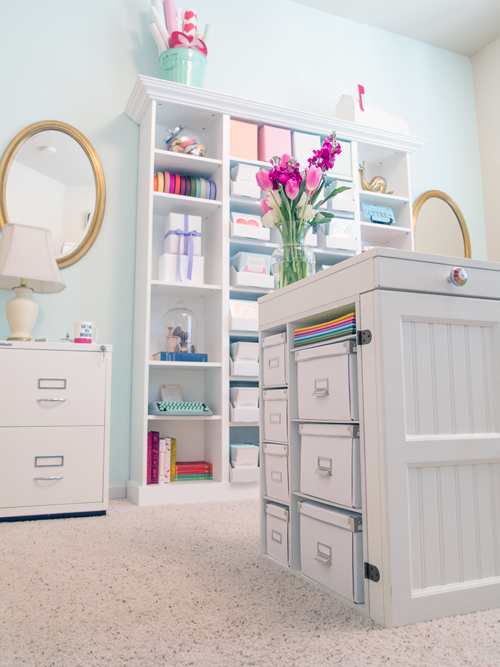 I used White KASSETT Boxes & Magazine Files to organize a wide array of items in a uniform way." 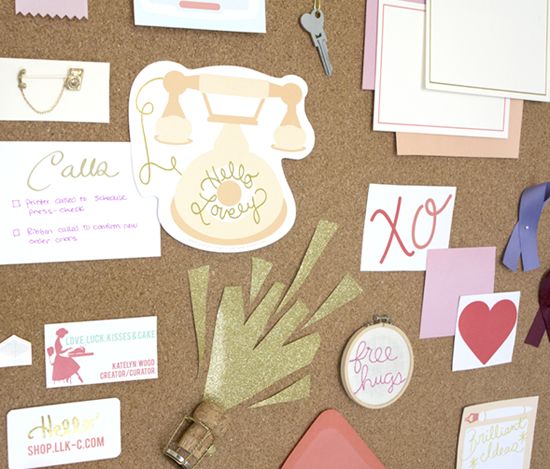 "Being a stationery designer, I wanted the space to reflect my love for HAPPY MAIL! I sought out fabulous vintage finds, colorful accents & decorated the space with products from my shop. 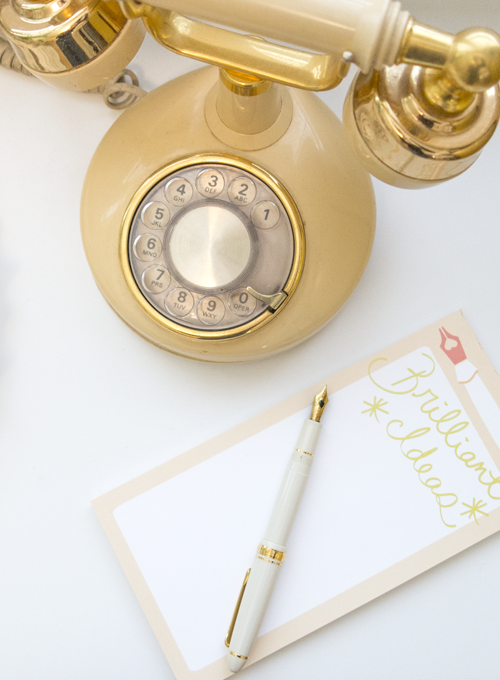 Favorites here include my cheerful notepads, a vintage La Poste Sign & a fun Mint Green Tape Dispenser!" "I really wanted to have a beautiful display case to feature my products. I turned to the versatile IKEA Billy Bookcase & enlisted the handy skills of my husband to create the perfect custom bookcase for my studio. (Get the full DIY tutorial on my blog here!)" "I have always believed that you should surround yourself with beautiful things, wonderful people & celebrate the simple delights in everyday living. Having the perfect place for everything & being able showcase my work in such a happy space brings me so much joy! I truly love having this bright space to come to & be creative." Seriously stunning right? 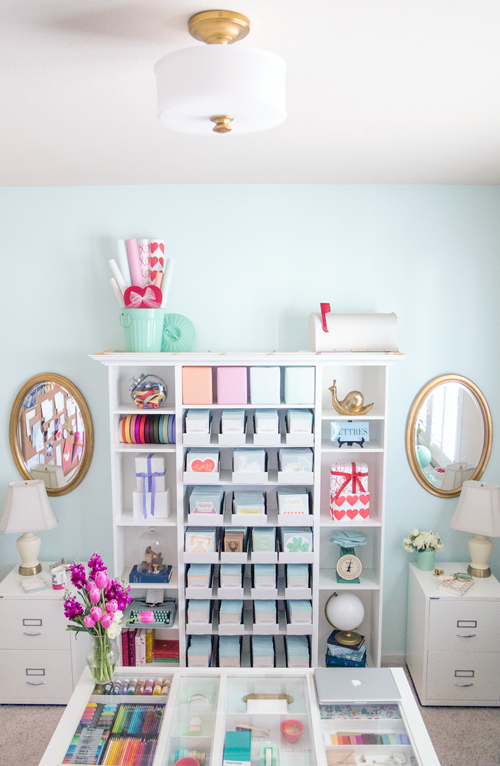 Everything from the wall color to the storage furniture to the sweet memo board paired with vintage touches... sigh. I am in love! 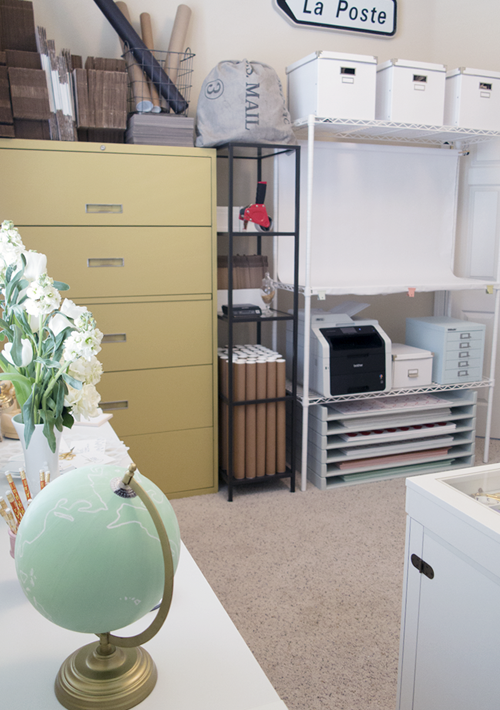 Even regular ol' filing cabinets look chic and special in her gorgeous studio. I really do heart the heart you all put into your makeovers big and small. You can see this space was well thought out, there is an attention to detail and so much joy radiates from the screen (and I am sure even more in person). Many of the items are very basic pieces (file cabinets, craft table, globes, bookcases, boxes....), yet they were given little updates with paint, moulding and color to take them to the next level. A job very well done Katelyn! I will be moving in next week, wink wink! You can find even more details and a list of sources over on Katelyn's blog here. * All images courtesy of Love. Luck. Kisses & Cake. I seriously need stop reading these posts. So beauty! Totally jealous! What a gorgeous room! I wish I had a whole room for an office. Sign. But just wondering, where is the desk from? So gorgeous and functional! Wow this is beautiful! I love the idea of keeping a studio white with pastel accents. It helps make it looks bright and inviting. Omg I love this! If I had any talent for it I would love to have my own stationary business! An absolute stunner! I think it's safe to say this is every girls dream office! Great work Katelyn and thanks for sharing! This now has inspired and me wishing I had a space like this to work or even escape to. Oh! The workspace is so inspiring. I wish I could create something like that! I will have a look at the links she's shared for ideas on how to work with what I have. Thanks for sharing. Wow! What a beautiful workspace! I especially love the desk. Where did you get it? I love this space! It feels clean and organized, but also creative and colorful! I think those are all important to me in my office. I love the color palette! Where are the extra wide paper trays from? Oh my this is lovely! I would enjoy working in this space for sure. 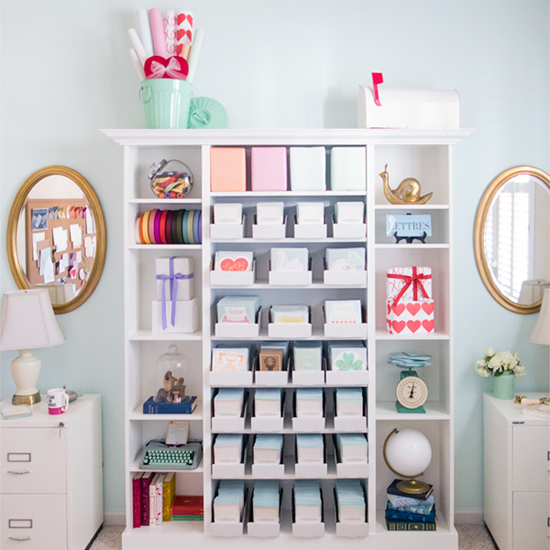 I love the pops of teal and all of the organization. Gorgeous!! Thank you for the inspiration for my future office redo! Such a pretty and creative space! This is so dreamy! I am in heaven! My favorite part - those coordinating mirrors. What a great way to add interest, light and space to an office. I want to work with her! Wow, if only my office space were to look that nice! Thank you for sharing. I'm going to pin this to my Pinterest board to look back at later and learn from!